When charged with a DUI in Arizona, you need an Arizona lawyer that routinely handles Arizona DUI cases. The best outcome for your DUI defense will depend on your Arizona DUI legal defense that includes an immediate and complete evaluation of Arizona DUI case. The investigation should include evaluating police procedures, chemical testing, and FSTs as they pertain to Arizona DUI laws. Hiring an Arizona DUI defense attorney is a very important decision that should begin even before the first day of your Arizona DUI court date. Your Arizona DUI defense attorney should have knowledge in handling an Arizona DUI, Arizona drunk driving investigation under Arizona DUI laws that includes all the Arizona DUI field tests. Also, your Arizona DUI lawyer should able to respond and answer all your Arizona DUI questions. 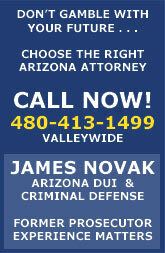 The Law Office of James Novak has the needed Arizona DUI knowledge and Arizona DUI experience to provide a legal DUI defense for anyone charged with an Arizona DUI in all courts in Arizona when you have been charged for a Maricopa County DUI, Phoenix DUI, Tempe DUI, Mesa DUI, Gilbert DUI, Scottsdale DUI. James Novak is an experienced Arizona DUI and Arizona criminal defense attorney who can handle your Arizona DUI misdemeanors, Arizona DUI felonies including the Arizona MVD hearings. 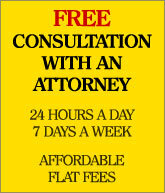 To handle your Arizona DUI case without hesitation, we provide a FREE consultation with an attorney. This includes an initial discussion on the facts surrounding your Arizona DUI charges, the field sobriety tests, blood or breath test related to your stop and investigation of your Arizona DUI, drunk driving arrest. Your Defense begins at the moment you are observed and stopped by a police officer. A DUI is not a standard criminal offense because there are numerous defenses that could exist. These include, but not limited to, an illegal stop if your vehicle, improper drawing of your blood, improper testing of your blood, breath, or urine, improper questioning, violation of testing procedures as they relate to Field Sobriety Testing, Horizontal Gaze Nystagmus test (eye test), improper calibration, validation, or operation of testing equipment related to the blood, breath or urine test, etc. Contact The Law Office of James Novak at (480) 413-1499 right away for a complete and immediate investigation for your defense. 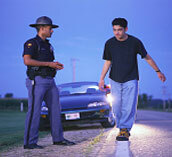 There are different types of DUI offenses in Arizona. Typically, most are charged as an Arizona misdemeanor DUI, but under certain situations can be charged as an Arizona felony DUI. Generally, a driver in Arizona can be prosecuted if a person's ability to drive has been impaired to the slightest degree due to the consumption of alcohol or drugs. Any type of Arizona DUI is an extremely serious offense. An Arizona DUI conviction can result in loss of your Driver's License, incarceration in the County Jail, counseling, fines and fees, and any other penalty the court may impose. Other issues include time away from employment, loss of employment, time away from family including kids, loss of regulatory licensing in Arizona such as nursing, Arizona teaching, broker, truck driver, pilot, Arizona real estate license, etc. Know your Arizona DUI and Arizona Criminal Defense rights before your first court date. The Law Office of James Novak will provide the defense for you Arizona DUI and Arizona Criminal Defense matters for anyone charged with an Arizona DUI in all courts in Arizona including Maricopa County DUI, Phoenix DUI, Tempe DUI, Mesa DUI, Gilbert DUI, Glendale DUI, Scottsdale DUI in the handling of your Arizona DUI misdemeanors, Arizona DUI felonies including the Arizona MVD hearings. Call (480) 413-1499 for a FREE consultation with an Arizona attorney. Disclaimer: The information contained in these pages is to educate and should not be relied on as legal advice. Always consult with a qualified Arizona DUI attorney or Arizona criminal defense lawyer. Read Our Legal Disclaimer. The Law Office of James E. Novak, P.L.L.C. azdrugcrimes.com © 2007 - 2019 James E. Novak. all rights reserved.